Image example Senegal dey lead for Africa ontop strong cigar packaging rules. Cigar packaging for Senegal don change. Now, wetin you go see on top cigar packet na photo of sick people to show wetin cigar smoking fit do. Government don make am compulsory say make people wey dey sell cigar write tins like ''smoking dey cause slow and painful death'' or ''smoking dey lead to impotence'' join with photo of people wey dey suffer sickness. Image example Experts say young people wey dey smoke regularly go continue as dem old. Why Senegal dey take the lead ? Senegal health minister, Awa Marie Coll Seck, talk say government chook eye inside di matter and na wetin dem find na im make dem make dis law. Smoking dey kill 6 million people every year, and na for South Africa and some parts of North Africa e bad pass. But experts talk say di wahala don dey spread go poor developing countries wey still dey grow. 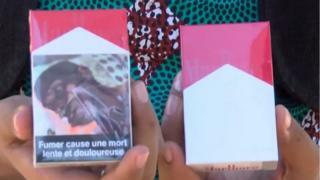 Image example Di strategy na to use dis kind packaging discourage smoking. Africa market na good opportunity for tobacco industry because African countries no dey make strong laws to protect dia people like developed countries. Younger Africans don dey smoke more too and dis na wetin make Senegal take action. Di anti-smoking law wey dem do for 2014 na one of di strongest for di world. With dis law, you no go fit smoke for public place and you go enter yawa if dem catch you say you dey sell cigar to underage or for school area. Image example Australia strong tobacco packaging law make way for countries like UK, to do the same thing. Na about 1 billion people nai dey smoke tobacco around di world.
. 5.8 trillion cigarettes na di number wey people smoke for 2014 alone.
. E dey kill about 6 million people around di world every year.